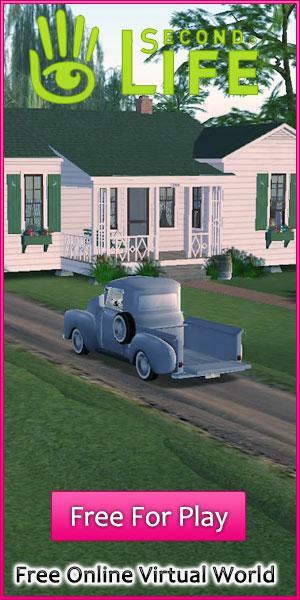 Virtual Worlds for Girls Article - Virtual Worlds Land! Rate this Article With so many virtual worlds available to play, and millions of people all over the world playing them, what is it that attracts the the young women of the world to join in such a virtual environment? In this article we will cover some of the specific areas that draw in girls. Virtual Worlds have become hugely popular, and in this article we will discuss some of the things that girls enjoy to do inside of the worlds. With so many options that mimic real life, and yet can be so much more we will try and cover the main reasons that young women, and not so young too will play these games. One of the biggest attractions is the ability to complete a huge wardrobe of amazing clothes, without spending all of your hard earned money. There are thousands of clothing combinations available for you to try on and walk away with. All of the virtual worlds around have the option to buy clothes, but in Blue Mars you can also do a full makeup set to match your outfit, and create your own designer label. With tools created just for you to be able to make clothes, and then try them on or sell them. But where Blue Mars goes that extra mile is the layering of clothes available to you. Wear a light dress over a dark top and jeans, or a complete smart suit outfit all over the top of one another to look seamless. Once you have your outfit then you can apply the perfect makeup. Zoom in on your face and get that perfect touch before you strut your stuff in the wide world. Once you have your look set, you can head out to the party scene and show off your creations and dance moves on the clubs and nightlife scenes of Second Life. With such a huge world to explore you will be able to find a live music gig, club or party to suit your style. With events being listed in Second Life you can pick and choose the event you want to go to, and meet lots of new people with similar interests to you and then dance the night away listening to your favorite artists. If partying is not your thing, you can always buy and decorate your own cool place. In WoozWorld you can rent or buy your own flat and then do it up in any decorative style you want. You can pick everything from the colour of the walls to the sofas and lamps. Once you have your pad the way you like it, you can invite your friends over and host your own party. If you don't like the look you can change it with the press of a button, and redesign a beautiful home to your own styling. Now only can you own cloths and apartments, you can also raise and look after your own pets, from cute kittens to dogs and everything between. Almost all of the worlds available have the opportunity for you to own and look after a cute pet. The game ourWorld in particular has a dedicated pet store where you can find your perfect companion. Look after your pets, find them fun costumes and share your experiences with your friends. Virtual Worlds are built on meeting other people, without someone to talk to these games are just not the same. If you want to just go meet people, or hang around with your friends there are many opportunities for you to meet up with friends and simply hang around and have fun as a group. There are cafes, parks even swimming pools you can just chill out and relax in. Enjoy a coffee with your friends or make new ones in some cool hangouts. Just like the real world you will meet people and make connections. In some cases those friendships can become very close. In a virtual world you can also take it to that next step if you meet the right person. There are some beautiful places that you can take someone out on a date, long walks on the beach in the evening or going for horse rides. When you find that right person you can open a door into romance and take the 2 of you to some wonderful peaceful and quiet locations to get to know each other better. Some of the worlds are truly beautiful and you will be able to find that perfect spot just for the 2 of you. From romance can come that special relationship, and in a virtual world you can take that special person into a true marriage. In Second Life and WoozWorld there are churches where you can get married. You can organise the whole wedding, guest lists, outfits for yourself and your partner. Not to mention having flowers, cakes and a great party afterwards. You can choose everything that you dream of for marriage. And of course you are not limited to a church. You can marry anywhere in the world, from your favorite restaurant to that perfect castle. The limit to your wedding is your imagination. But the family does not stop once you have the ceremony, some of the games available allow you to adopt your own child. The Games Meez, Second Life and IMVU all allow you to have a baby, and raise them as your own child. You will need to look after them, feed them clothe your child and raise them just as in the real world. In any of these games you can find that special someone and raise your own family. This is just a taste of the opportunities available to you. There is a virtual world for you with so much fun and so many things to do, we hope that you have found some inspiration from what you have read here. Choose your world, and go out and explore, and most of all enjoy what you do and what you create for yourself.